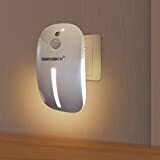 This Plug-In Night Light with motion and light sensor is ideal for adding a natural light in nurseries, children's bedrooms, landings and hallways. The night light consists of 9 LEDs: front light (which activate in darkness and turn off automatically when light is detected) and rear light. Automatically rear light switch on when it detects people's motion in the dark, and stays on for 60 seconds. Adjustable mode: Auto / on. The single strip, which is on all the time, the slit of light at the front being perfectly sufficient to guide you until it picks up your movement and comes on fully..
For use with the Eveready night light. 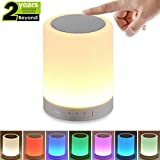 MULTI FUNCTION: The device has multi-coloured LED's to give a nice coloured accent / night light, as well as a speaker ,can be used indoor or outdoor. compatible for most of digital equipment with Bluetooth. 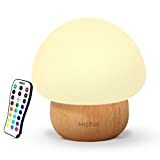 NICE AND SIMPLE DESIGN: Solid white color with lovely Cylindrical shape design make the night light very good looking The bottom edge of the lamp contains the controls for the music feature, as well as all of the connections (a MicroUSB charging/power socket, 3.5mm AUX audio in socket and a MicroSD card socket. 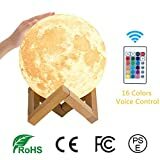 Also included in this section of the lamp is the microphone that can be used to make hands free calls when connected to your smartphone. LONG WORKING TIME: It is equipped with rechargeable lithium battery supports up to 7 hours music play back(Affected by Volume/ Light Brightness) after fully charging for about 4 hours. Just enjoy the warm light and music, while you are READING, doing YOGA, romantic CANDLELIGHT DINNER or CAMPING indoor or outdoor. HAND-FREE CALLING: You can use it to answer or hang up the phone. User-friendly precision keys panel, Answer call/End call/Play/Pause/Pair),which also allows you to select songs and adjust the volume. 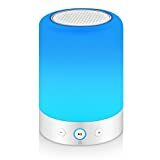 PORTABLE SPEAKER: High quality wireless stereo speaker, support Micro TF card. With a metal handle, can be hung up or carried by hand. Apply to camping, reading or romantic dinner. 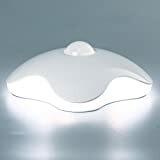 Magic Mouse Style PIR Light Indoor. It detects living movements automatically. The rear light switch on brightly when it detects people activities, time delay stays on 60 seconds. 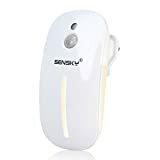 LED Sensor Light 2-in-1: Compact mouse shape outlook design, light sensor(the front light will be on slightly in dark all the time) and motion sensor, smart on and off. Eye-Protection. The 15-lumen back-lit was designed to prevent dazzling to the eyes from glaring direct light, especially helpful for children and people who wake up to go to washroom per night. Automatic Night Light Plug In. Plug into AC 220V - 240V outlet directly, no battery needed, 1.8 watt output, environment-friendly and energy saving. 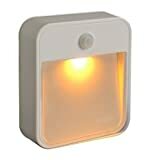 Safety Motion Sensor Night Light. This motion night light has high quality made of lightweight fire resistant plastic, with AUTO / ON 2 modes available. Friendly customer service with 1 Year Warranty. More convenient to use: Press A key to control the warm white light; Press B key to switch the lamp color, 8 colors in all. C key to control the rotatation. Easy to charge: Can be charged with USB cable(included) or 4 PCS AAA batteries(not included). The USB cable is 0.8 meter and can be connected to computer or plug. Designed for sleep areas: bedrooms, bathrooms and hallways. Amber light provides soft safety lighting for getting up during the night and waking up in the morning. Designed to get approximately one year's worth of light on each set of batteries (not included) with average use of 8-10 activations a night. Motion and light sensors allow the light to turn on only when motion is detected in the dark. Auto shut off after 30 seconds of no motion helps prolong battery life. 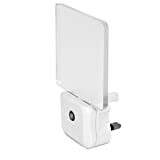 Battery powered for wireless installation in less than 5 minutes with the included screws or double-sided adhesive. ESAY TO CONTROL: Tecboss nursery night light is designed for children to learn and play; kids can touch the top to adjust the brightness brighter or dimmer. 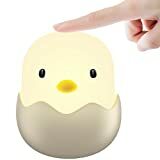 DURABLE & BABY SAFE: Made up with toy-grade material, ABS base and silicone make it a 100% safe chick tumbler mood lamp. EYE-CARING LED &CHICK TUMBLER DESIGN: Energy-efficient and eye-caring LED creates a uniform non-flickering night light that doesn't hurt the eyes;Chick tumbler stylish can create a dreamlike atmosphere for your room. Suitable for bedroom, nursery, baby room, decorative lamp and other romantic places. 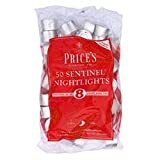 WARM ATMOSPHERE: Perfect for action at night and it gives out appropriate soft light without waking up your babies and husbands when it comes to breast feeding or diaper changing. Cozy night light to soothe your kids to sleep as well. OSRAM NIGHT BREAKER LASER H7: Combination of a highly-developed filament and pure Xenon filling for the most powerful automotive light from OSRAM. Up to 130% more light (compared with standard lamps) on the road with a precisely engraved window for optimal lighting on the road surface. A light cone up to 40 meters longer (compared to standard halogen lamps, depending on type): for better visibility and significantly better response times. 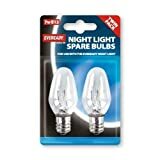 Up to 20% whiter light (compared to standard halogen lamps): for fatigue-free and relaxed driving. 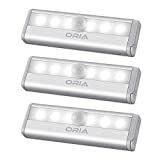 Specifically developed for the performance-oriented driver with high luminous intensity requirements and ECE certified. 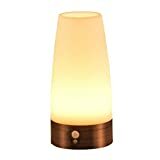 Newest Night lamp - The brightly LED night light not only for lighting,but also a great decoration! A sling is added to this version, the product can be hung anywhere you want. When it's on the mode of warm light, you can bring it while walking in the garden or during camping. 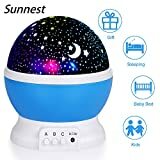 Romatic projector toys lamp:4 main lights-warm white, blue, red and green, a rotary button provide beautiful night light picture to your kids and baby! Give your lover a surprise and romantic moment, help your baby fall asleep easily. And the vivid starry sky help to develop your kids talent and creativity. 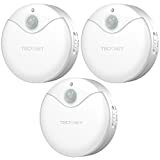 Timer Function:There are 5-995 minutes to settle,then it can shut off automatically.Long press can set the time longer.Comfort for your baby to sleep,You can falling asleep at ease.Make children clam down and sleep well with a sweet dream.In addition, the new engine assures no noise when the light is on, providing you a quiet space to enjoy your time. Easy to Use:A button for timing control.B button turns the rotating feature on and off.C button cycles through colors. 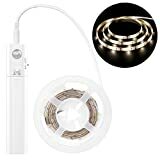 4 Led Lead beads lights to change,monochrome light or colorful light overlay.Press 9 times to shut off.A button turns on a bright, steady, white light. And there is Total ON/OFF button at the back. 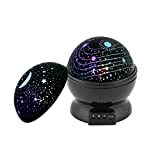 Baby Toys lights:All the time,it is best choice to your Girls and Boys as a christmas gift.Special children toys for baby will surprise at night.This is great for Wecken curiosity in the children's for Universum Astronomical Science. And don't afraid dark at night.Night light for kids with sturdy hanging strap makes it easier to your fishing,camping or living. Adorable Mini Size & Amazing brightness - it can give out no less brightness than bigger size product. Motion Activated - it will light up automatically when someone passes or move within the scope of 3 meters. It will turn off after 15 seconds when no motion is detected. Simple Installation - remove the adhesive tape of the magnetic strip and stick it to anywhere you want, and mount the light on the strip after loading 2 AAA batteries(not included). Multiple Occasions Suitable - mini size, multiple use. You can use it on book shelves, drawers or shoe cabinet, where the ceiling light cannot reach. Stylish Design - it's a perfect gift for your friend and family, for its inexpensive and effective stuff for daily use. 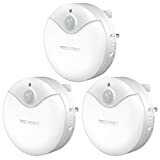 Sophisticated motion sensor combined with light sensor allows it keeps light on only when in dark and motion detected, Auto-off after 20 seconds of no motion detected. 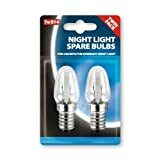 Great for kids/nursery or evening up in darkness. Built-in 550mA rechargeable lithium battery up to 3 months using, save your money buying AA batteries and save the earth. Comes with USB charging cable, full battery charge time is 2-3 hours. Bright but no dazzling due to unique clover inspired design, made of premium quality makes it a great decor in your living space. Safe for touch of children. Easy to install, no hard-wiring. Use 3M adhesive tape in packge to stick it anywhere you want. Perfect for bedroom/toilet/hallway/corridor/stairs/aisle/drawer/car trunk or any other environments you want. One year NO Questions asked warranty GUARANTEED. 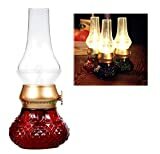 Lenova LN101 is the ORIGINAL clover night light, don't buy other cheap and low quality replica! 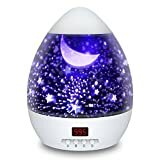 Cosmos night light projector can create an enjoyable and relaxing bedtime experience for children. Also perfect for adults nursery to attain a relaxing and calming effect in the bedroom, living room, bathroom or spa. 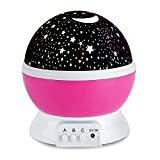 Helps drift into a calm and peaceful sleep.Enhance children's imagination: the star sky moon projector light helps you to bring the sky and star back home, kids can recognize the different colors, also improve their concentration and imagination. Multicolor led star night light Projector ,It have 4pcs super bright red green blue white leds. Can change multicolor creating a romantic, leisure and cozy atmosphere of the space to achieve physical and mental relaxation effect. UPDATED USB RECHARGEABLE DESIGN, give up the batteries, saving energy and money, environmental friendly, it lasts 1-2 months once get charged, much more convenient and smart. MOTION & LIGHT DETECTION SENSOR Toilet Nightlight- The built in motion sensor detects body heat to automatically illuminate the room when you enter and shut off when you leave, the light is definitely sufficient to give enough light for the entire bathroom, at the same time the light will not disturb your family members when you get up in the middle of the night.Also a safety product for older ages. 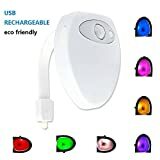 8 LED COLOR CHANGING TOILET SEAT LIGHT, 8 different colors you can choose from, you can either leave your toilet light cycling through all 8 colors while on, or you have the option of choosing one of the colors and keeping it on that color, the pretty LED colors also can be a special decoration of your bathroom, your children will definitely like it . EASY INSTALL AND TAKE OFF, WATERPROOF DESIGN, The FLEXIBLE ARM can be bent to secure the unit for any size toilet bowl- resting just below the seat lid and onto the rim. The bendable arms provide a more secure fit than other toilet lights with cheap suction cups. 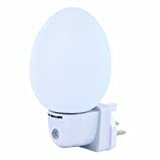 LIFETIME WARRANTY Motion Activated Toilet Night Light, we always put product quality and customer service at first place, if anything goes wrong with your illuminated toilet night light, please feel free to contact with us, we will send you a new one or make refund. 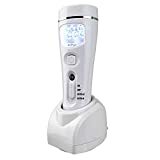 [Soft Bright Lighting] - the motion sensor light with 12 LED provides a bright glow. Warm white LED light is more soothing and relaxing. Fantastic Energy saving and environmentally friendly LED ensure an extra long life for your light. 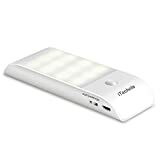 [Rechargeable Battery] - Built-in 500mAh lithium battery, last up to 4 hours constant lighting and last 3 weeks on auto mode after full charged; Rechargeable by USB cable (supplied) compatible with power bank, PC USB port, wall charger. [Three Lighting Mode] -ON / OFF / AUTO. Using PIR technology, the LED sensor light will auto turns on when detecting people coming at night or a dark place, auto off in 15 seconds if no more motion. It is also possible to keep it always off/on, depending on your needs. 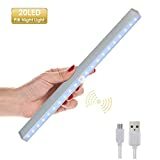 [Easy to Install] - With the included magnet strip and 3M adhesive tape, this night light could be hung or stick-on, No tools, screws or nuts required.The LED light body can be easily detached from the magnetic strip for recharging. [Broad Application] - Suitable for cupboard, closet, stairway, drawer, under-cabinet, pantry, bedroom, wardrobe, workshop, bookshelf, attic, closet, basement, hallway, corridor, headboard, etc. Nightlight for mains wall socket with LED sensor. Suitable for the hallway, stairwell, landing, basement, garage and other dark rooms. Light comes on automatically in darkness and goes off automatically in brightness. The LED light is bright enough to see your surroundings in the dark, when putting on the main home lights is not necessary, which is great for those middle of the night bathroom trips and helps to avoid tripping or accidents. The Ansmann Automatic Nightlight with Sensor has a high life expectancy and thanks to the latest LED technology. 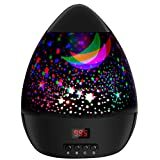 【SMART PROJECTION & ADORABLE SHAPE】: Unique and colorful star light projector with cute egg shape which projects a night sky of moon and stars on your ceiling or walls. A sling is added to this version, the product can be hung anywhere you want. This is great for arousing curiosity in the kids for universe and astronomical science. 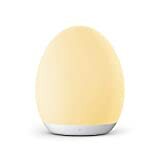 【TWO FUNCTIONS LAMP & 4 WORKING MODE】: Constructed with removal egg shape cover. You can make it operates as a night light. Or remove the outer cover to enjoy the wonderful starry stars show. Mode A:warm white mode.Mode B: switch for colorful light(single color light or colorful light).Mode C:360° rotary switch. Mode D:set the time up to 995min. Warm Tips: Must set time greater than 0 then lighting buttons and rotation button will be set to be effective. 【USB & BATTERIES POWERED】: You can power it via a USB cable connect to your computer, laptop or power bank(USB charger is NOT included). Also it can be powered by 4 AAA batteries(Batteries are NOT included). Please note that USB cable and batteries can not be used at the same time. 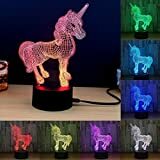 【INCREDIBLE GIFT FOR KIDS】: This great night light is ideal for kids children scared of the dark at bedtime.Great decoration for wedding, birthday, parties, bedroom, nursing room. Also a great gift for birthday, Christmas, Children's Day. 【100% RISK-FREE SATISFACTION GUARANTEE】: We also offer you 100% risk-free satisfaction guarantee to let you buy with confidence; no questions asked. Moreover, we are known for our excellent customer service and support. If you have any query or suggestion, just feel free to contact us, 24 hours friendly e-mail back! SPECIAL DESIGN - 3.28ft strip length, small in size, free to change the shape as you desire. 30 SMD 2835 leds, 600lm brightness, bring sufficient light to meet your daily needs. DUAL MODE - Infrared Sense & Manual Operation. "AUTO": auto on if motion detected within 10ft in the dark and auto off after 20s if no motion detected; "MAN": run by the "ON/OFF" switch. ENERGY SAVING - LED consumes up to 2.4W to produce the same light as 10W incandescent bulb. Lights will flash when there is low power to support it, reminds you to replace the battery. EASY INSTALLATION - Magnetic strip with 3M adhesive tape included, allow you set the whole thing up to wherever you need extra light. Also can be cut to the length under black line. MULTI APPLICATIONS - A practical led strip light that can be stuck to anywhere even curved surface. Suitable for bedroom, drawer, closet, garret, cabinet, kitchen, corridor, etc.